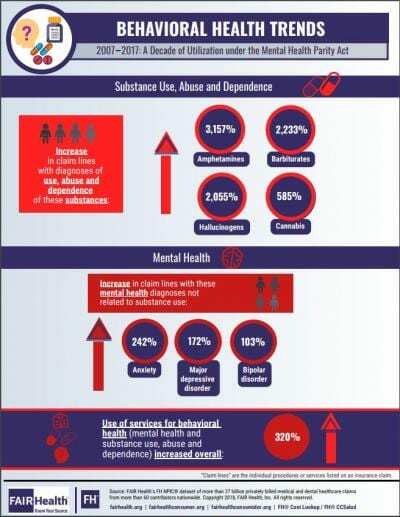 NEW YORK, NY–December 18, 2018–Private insurance claim lines for amphetamine use, abuse and dependence increased 3,157 percent from 2007 to 2017, according to a new behavioral health study by FAIR Health, a national, independent, nonprofit organization dedicated to bringing transparency to healthcare costs and health insurance information. Amphetamines include medications frequently used to treat attention-deficit/hyperactivity disorder (e.g., Ritalin), narcolepsy and obesity. Utilization of privately billed medical services for anxiety increased 242 percent in the same period. The initial study results are shown in the infographic. FAIR Health is preparing a more expansive white paper on behavioral health (mental health and substance use disorders) from 2007 to 2017, to be released in the coming months. The period from 2007 to 2017 marks the time from just before and since the Paul Wellstone and Pete Domenici Mental Health Parity and Addiction Equity Act of 2008 (Mental Health Parity Act). That law required most group health plans that cover physical and behavioral health to provide the same level of coverage for behavioral services as for medical and surgical services. FAIR Health data show that private insurance claim lines for behavioral health diagnoses increased 320 percent overall from 2007 to 2017. Adjustment disorders (including those with anxiety and depression)–65 percent. FAIR Health is a national, independent, nonprofit organization dedicated to bringing transparency to healthcare costs and health insurance information through data products, consumer resources and health systems research support. FAIR Health possesses the nation’s largest collection of private healthcare claims data, which includes over 27 billion claim records contributed by payors and administrators who insure or process claims for private insurance plans covering more than 150 million individuals. FAIR Health licenses its privately billed data and data products–including benchmark modules, data visualizations, custom analytics, episodes of care analytics and market indices–to commercial insurers and self-insurers, employers, providers, hospitals and healthcare systems, government agencies, researchers and others. FAIR Health also holds separate data representing the experience of all individuals enrolled in traditional Medicare from 2013 to the present (as well as Medicare Advantage enrollees represented in its private claims data). Certified by the Centers for Medicare & Medicaid Services (CMS) as a Qualified Entity, FAIR Health receives all of Medicare Parts A, B and D claims data for use in nationwide transparency efforts. FAIR Health can produce insightful analytic reports and data products based on combined Medicare and commercial claims data for government, providers, payors and other authorized users. FAIR Health has earned HITRUST CSF and Service Organization Controls (SOC 2) certifications by meeting the rigorous data security requirements of these standards. As a testament to the reliability and objectivity of FAIR Health data, the data have been incorporated in statutes and regulations around the country and designated as the official, neutral data source for a variety of state health programs, including workers’ compensation and personal injury protection (PIP) programs. FAIR Health data serve as an official reference point in support of certain state balance billing laws that protect consumers against bills for surprise out-of-network and emergency services. FAIR Health also uses its database to power a free consumer website available in English and Spanish and an English/Spanish mobile app, which enable consumers to estimate and plan their healthcare expenditures and offer a rich educational platform on health insurance. The website has been honored by the White House Summit on Smart Disclosure, the Agency for Healthcare Research and Quality (AHRQ), URAC, the eHealthcare Leadership Awards, appPicker, Employee Benefit News and Kiplinger’s Personal Finance. FAIR Health also is named a top resource for patients in Elisabeth Rosenthal’s book, An American Sickness: How Healthcare Became Big Business and How You Can Take It Back. For more information on FAIR Health, visit fairhealth.org.